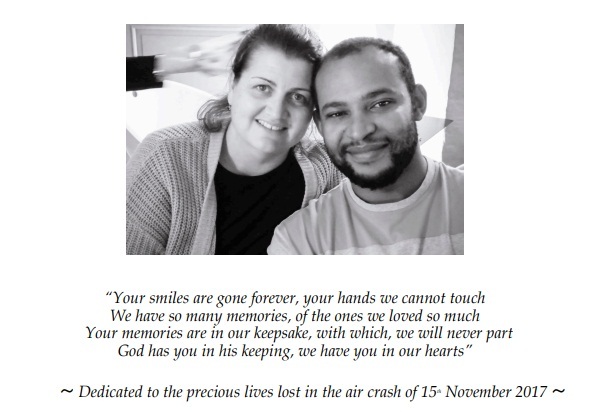 Donna Duggan, the Australian co-founder of leading African tourism companies Maasai Wanderings and Nasikia Tented Camps (Tanzania) has released a heartfelt tribute to 11 people, including her husband, who lost their lives on 15 November, 2017 when a Cessna 208B Grand Caravan aircraft operated by Coastal Aviation was involved in an accident above the Ngorongoro Conservation Area in northern Tanzania.Almost a year ago, en route to Serengeti, the fatal aircraft accident in Tanzania, in the region of Ngorongoro Crater, claimed the lives of 10 passengers and a solo Captain including Mr Naseeb Mfinanga, Co-Founder and Co-Owner of Maasai Wanderings Ltd, the esteemed East African DMC (Destination Management Company) and Nasikia Camps Ltd, Tanzania. www.maasaiwanderings.com & www.nasikiacamps.com. Mr Mfinanga’s brother, Mr Shatri Mfinanga and the company’s IT Manager, Mr Gift Lema were also onboard the commuter flight. The causes of the accident remain under investigation by the TCAA. Nasikia Camps (Nasikia Tanzania Ltd) and Maasai Wanderings (Maasai Wanderings Ltd) in Tanzania. “As 2018 draws to its final months it is appropriate to explain the future vision and mission of Maasai Wanderings, together with Nasikia Camps,” Ms Duggan added. Vowing to continue with the work she and Mr Mfinanga had commenced, Ms Duggan has continued to pursue their plans driving the company forward over the past 12 months in honour of her husband and to ensure her two young children can look back in times to come and be proud of their mother and father. In February 2018 she opened new venture Ehlane Plains, a luxury safari camp, as Naseeb Mfinanga had envisioned. The development of the Tarangire Ndovu Camp followed, becoming a permanent structure, to be completed and relaunched by the end of 2018. In February 2019 the company will open Mandhari Lodge, overlooking the Great African Rift Valley, on top of the Manyara Escarpment, where Ms Duggan and her husband first created the vision which has now become a reality. Two further permanent, all year round camps are also under application: Kusini Kopjes Camp, Serengeti National Park (Kusini area) and Lamai Serengeti Nest, Serengeti National Park (Lamai Area. Ms Duggan said the strategic direction for her businesses was clear and that she would continue to develop her unique network of safari camps. “The basic philosophy of both Maasai Wanderings and Nasikia Camps, is to provide authentic, understated, experiential journeys, with luxurious touches,” Ms Duggan said. In tribute to those that passed in the tragic accident twelve months ago, a multi faith Service of Remembrance, will be held at the accident site on the 15th November 2018, at 11.30am, which is the time, it was estimated that the Cessna 208B Grand Caravan aircraft impacted the crater.